As the gallery curator of both First Impressions Gallery and Artalog I would often have art patrons ask me for my opinion and / or recommendations about purchasing emerging, established, local and international artists. Moreover, potential purchasers would ask me about the difference between original prints: Serigraphs (Silk Screens), Lithographs, Etchings, Relief. I have taught high school students (grades 9-12) since 2001 visual art, colour theory, graphic design, photography and Adobe Photoshop © . If you would like to have an individual acrylic paint lessons my studio then please contact: me@markbuck.art. I offer half day (4 hours) and full day (8 hours) options. I offer art rental of my available artwork (within the GTA). I will rent a work of my art at a monthly fee of TEN PER CENT of the framed value for a maximum of three months. If you decide to purchase the rented artwork then I will apply FIFTY PER CENT of the rental fee total towards your purchase price. 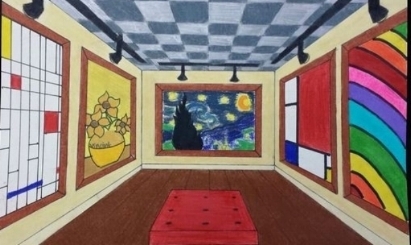 Damage caused during the rental and / or loss of the artwork is the responsibly of the renter. Insurance is your responsibility. I allow my potential purchasers to acquaint themselves with my artwork on a TRIAL BASIS in your home or office (within the GTA for either 24- 48 hours) prior to your purchase. A FIFTY PER CENT DEPOSIT of the framed cost is required. It will be refunded in full should you decide NOT to purchase the artwork; and it is returned undamaged and on time. At present there is NO H.S.T. There may be a nominal delivery /pick up charge. 1. Your proposed artwork purchases. 2. Recommend local GTA art galleries or artist studios that we can visit together. As of 2017 I am also a member of the Canadian Artists Representation Copyright Collective (CARCC). EMAIL: me@markbuck.art for further information . I would also be pleased to meet you at the Royal Ontario Museum for a free private gallery interpretation talk. Just pay for admission. If you are traveling internationally then I may be able to provide you with a free recommendation of museums and /or galleries that I have visited. From1978-1982 I was employed as in-house graphic designer, with a Toronto marine company, after studying for a semester at Pratt Institute, New York in 1976-1977. After establishing First Impressions Gallery in 1982 I designed all of my advertising layout, graphics and marketing for First Impressions. Above are my previous two "Mark Buck" logos that I have designed. The logo on the left side was in use from the 1970's to 1989. The one on your right side ( my "M B Loons Logo " ) has been in use from1989 to 2017. My current "markbuck.art" logo is a stylized "M and B". It is reflective of my three art interests: visual art, photography and sculpture. 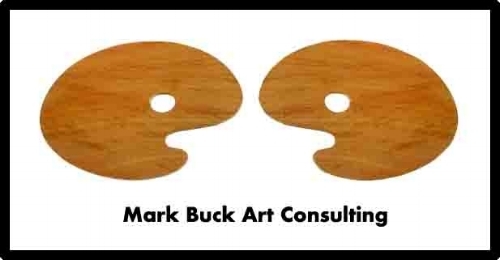 My logo "markbuck.art" is open on the bottom to welcome you into my art world for you to experience my creations.